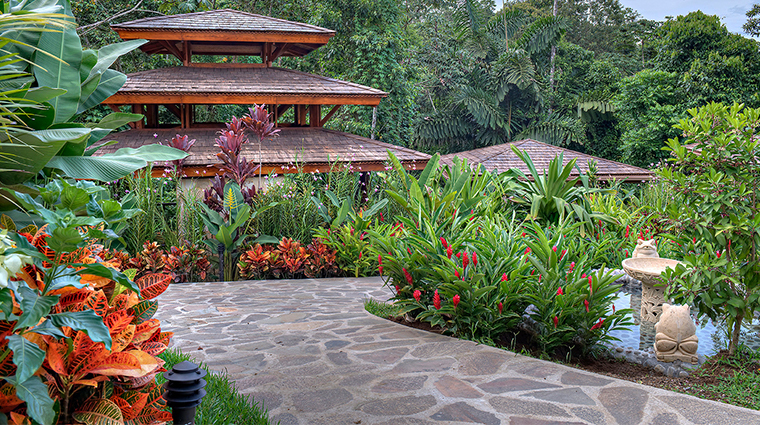 Nayara Resort, Spa & Gardens is a tranquil, lush hideaway located in the famous Arenal Volcano National Park and within the vast Costa Rican rainforest. You are met with an expansive and captivating garden filled with parrot plants, rosy button gingers, delicate orchids and bright air plants in an array of pinks and purples. Although many come for the views of the staggering 5,358-foot Arenal Volcano, it’s the luxurious eco-friendly rooms, authentic thatched-roof restaurants and the new spa that really captivate. The resort’s pool overlooks the rainforest and is surrounded by loungers and umbrellas (the swim-up bar has a thatched-roof, too). Perched on a cliff over the rainforest, the luxurious spa is in a league of its own. Treatments are held in outdoor spa bungalows and run the gamut from massages using volcanic mud to scrubs performed with Costa Rican Coffee. A personal host can assist with restaurant and spa reservations, excursion bookings and other special requests. Nayara’s location in Arenal Volcano National Park provides you with ample opportunities to venture into the verdant Costa Rican rainforest — and there are myriad adventures to be had. Horseback riding, biking, ATV-ing and hiking round out the heart-pumping activities in the area. 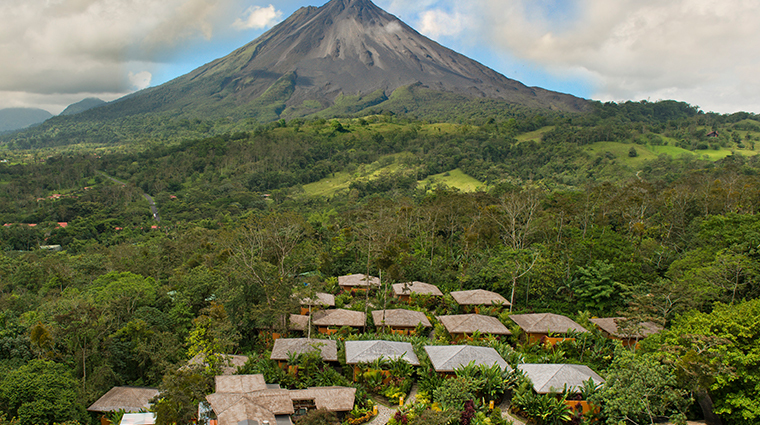 The eco-friendly hotel itself offers tours of the Arenal Hanging Bridges and guided hikes along the Toucans Trail, which crosses a lava flow along the slopes of the volcano. For an adrenaline rush, take an exhilarating zipline tour through the Arenal Reserve, go canyoneering down the rugged cliffs of the Pino Blanco waterfall or hit the nearby whitewater rapids in a guided raft tour. Villas are located within Nayara Springs, separated from the main resort by a 70-acre wooden bridge surrounded by hanging-moss-filled branches and fragrant flowers. This adults-only resort-within-a-resort is made up of 16 villas, each with 1,500 square feet of space. Services such as a personal host, complimentary yoga, poolside breakfast and complimentary laundry service come standard with these rooms. 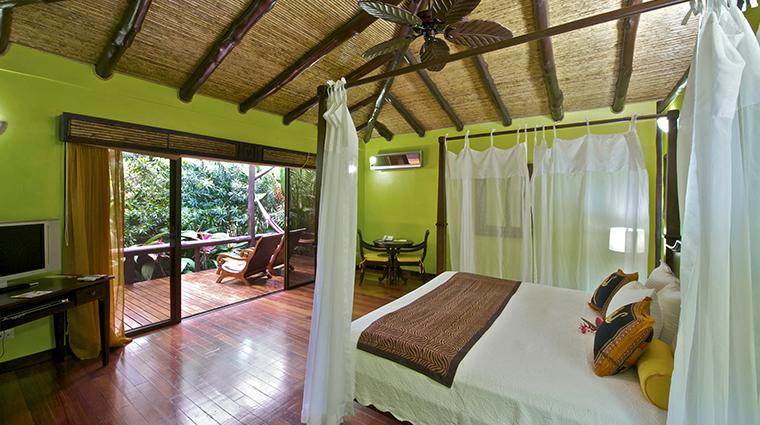 The Costa Rica hotel has an array of casitas, suites and villas, all of which are freestanding bungalows. 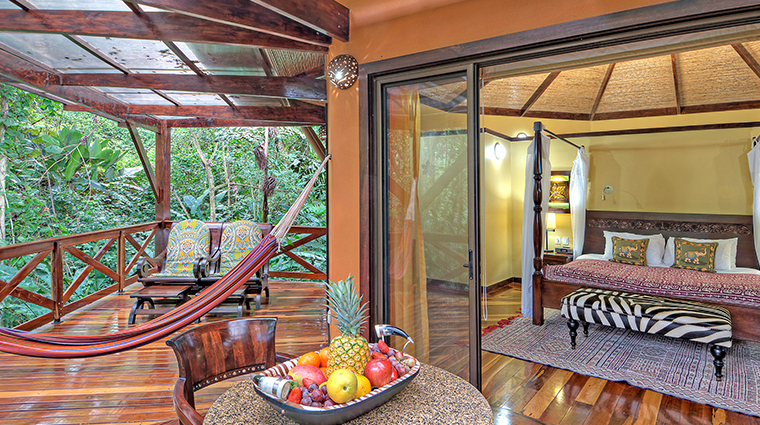 The smallest rooms, the Casitas, are 855 square feet and are dressed in hardwood furnishings and locally crafted accents such as hand-painted Costa Rican landscapes and handspun throw blankets. The casitas offer luxurious wraparound porches outfitted with hammocks and Jacuzzis where you can soak in the jaw-dropping views of either the volcano or the dense rainforest. Suites offer more space and an elegant ambiance — it’s quite apparent as soon as your feet touch the rich marble floors in the bathrooms. The unique octagonal shape of the rooms offers incredible natural light in the mornings and afternoons. An oversized Jacuzzi on the balcony provides complete romantic privacy with sensational vistas of the volcano. You can even listen to the sounds of the rainforest as you rinse off in a private outdoor shower. The four-poster beds face sliding doors that look out over a private garden where a locally sourced hardwood deck surrounds a private mineral-spring-filled plunge pool. The food at Nayara’s four onsite restaurants easily breaks the stereotypes about Costa Rica’s rustic fare. Each dining location gives a different taste, look and experience. 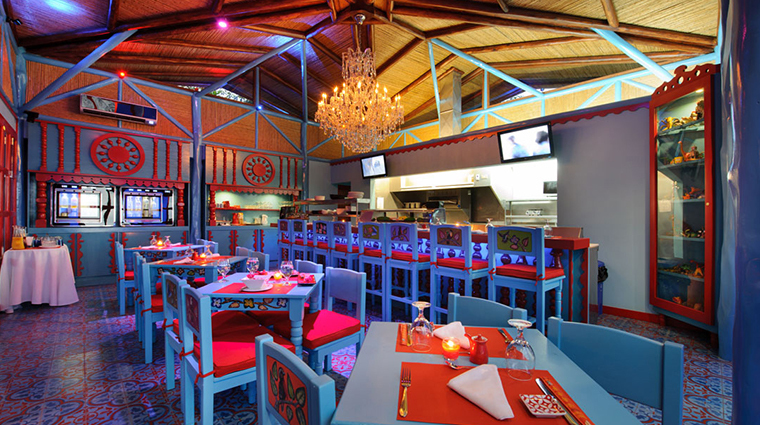 For an authentic taste of Costa Rican cuisine, sit down in the thatch-roof dining room at Altamira. The restaurant is open for breakfast, lunch and dinner and serves up dishes like local prawns, rich black bean soup peppered with spices and a poached egg, and chicken with rice, vegetables and crispy fried plantains. Sushi Amor serves Japanese classics in a brighter, more casual atmosphere (great for happy hour treats like mojitos, local craft beer and sushi rolls), while the Kali Kali Pool Bar turns out burgers and piña coladas as you lounge poolside. Nostalgia Bar keeps a menu of wine and tapas — think ceviche, charcuterie and Spanish-style crostini.